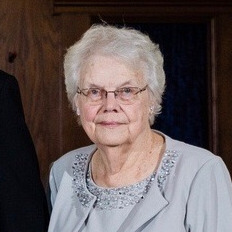 Martha Louise Devine, 85, of Roeland Park, Kansas passed away on March 21, 2019. Visitation will be held on Tuesday, March 26, at 9:30 a.m. followed by Mass at 10:30 a.m. at St. Agnes Catholic Church. She was born August 2, 1933 in KCMO and attended St. Therese Little Flower, Loretta Academy, Lillis High School, and then went on to business college. Martha is preceded in death by her parents, William and Virginia Massman, infant daughter Rosemary, sisters Mary Virginia Spies and Frances Madden. She is survived by her husband of 67 years, James, brother, Ed Massman, daughters Terry Sweeney (Dave), Cece Muder (Mike), Martha Sledge (Gary), Patty Willhite (Bill), Joan Muzyka (Alex), and Chris Tholen (Tom), 18 grandchildren, 12.5 great-grandchildren, and numerous nieces and nephews. In lieu of flowers, contributions can be made to St. Agnes Church, 5250 Mission Rd, Roeland Park, KS 66205, or a charity of your choice. What an amazing woman, wife, mother, grandmother...who will be missed by her amazing family! I was blessed to have the (younger) Martha as a great friend from High School to now. A great memory from HS days was calling for Martha and Mr Devine would ask which one, the older or younger one? It always stumped me...since I didn’t want to insult the older one by asking for the younger one. He loved it!! Just like he loved his wife. They were so sweet together and always together!!! They were blessed with a beautiful big family full of love and more family as they got married. Coming from a small family of 4, I was always jealous of the size of family fun times. Blessed, to have known both Martha’s for all these years...love to all who loved “the older” Martha!